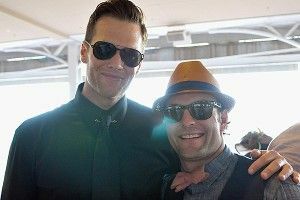 Take a long, hard look at Wes Welker in the above picture, posing with some random dude at the Kentucky Derby while wearing a really dashing Haberdashery by Jeremy Piven hat. Apparently, this is going to be one of the last shots of Welker with Jude Law–length locks. According to CSNNE.com, the New England wide receiver has undergone hair transplant surgery. You know what? Using the word “surgery” in this case is kind of insulting to people who have surgery. Let’s go with procedure. Welker had a hair transplant procedure. The procedure was performed by Dr. Robert Leonard of the aptly named Leonard Transplant Associates. So happy was Welker with the work of Doc Leonard that he will apparently become a spokesman for the institute. Worthy cause, to be sure. Here’s my question: Didn’t Wes Welker get his knee shredded and then get back into action in an absurdly short amount of time? Doesn’t he have Wolverine-level healing powers? He can’t apply some of that same restorative power to his hair follicles? Salute, Wes. May your Julio Jones locks flow like the mighty Mississippi.